Starting or expanding a business can be hard. Maybe you’ve come up with a killer business idea, or you have an amazing idea to expand your business. How do you get the capital to make that happen? What makes a business or a business idea appealing to an investor or bank? We’ll discuss this and more with Patrick S Weston, a successful entrepreneur and investor in St Pete. He is the managing partner of WestRock Investments, an investment partnership. Patrick has an MBA from the Northwestern Kellogg School of Management. Patrick is also a licensed medical doctor that is board-certified as an internist and cardiologist. This is episode 17, “Making Your Business Investable with Patrick S Weston”. Today we’ll be joined by Patrick S Weston of WestRock Investments. Patrick is a successful entrepreneur, investor, and medical doctor. He has MBA from the Northwestern Kellogg School of Management and an MD from the University of Pittsburgh School of Medicine. He is a board-certified cardiologist and internist. He is also the founder and managing partner of WestRock Investments which is a value-oriented, risk-focused investment partnership. Those are some serious credentials. I know, Patrick is one of those smart people, and I feel like the biggest simpleton ever. Yeah, Welcome Patrick, and I guess we should mention that we've actually known you for I think it was a year last month. A year ago you walked into our office with your business advisor and we thought, oh my god, this guy is for real, he really wants to talk to us. And a year later, here we are doing a podcast together. So welcome and is there anything else you want to add, tell us or anything else you want to share with us? Well, thank you for having me. I've been looking forward to this. It's hard to believe that it's been a year. It feels like it's been actually longer than a year. I think it was a year last month. I think you guys covered just about everything. That's the high points, I suppose. Okay, alright, so we're gonna talk about the highs, today, not the lows. Well I guess let's just dive right in and let's talk about, obviously, you're a doctor you're also a business person. So tell us about the intersection between business and medicine and how did two go together, and how being a doctor helps you be a better business man and anything else smart that you want to sprinkle in. Yeah well, I guess the place to start would be how I got here. I started out as a science major, very curious mind, a science geek. I was actually the social chair of the microbiology club. Oh my gosh! That is kind of a big deal. If you can imagine that. Always liked science, though. And went to medical school, then my training, and then at some point decided that there's a lot more to be done in medicine and there's a lot more that I can do. And I kind of started to understand the bigger pictures of medicine. It's a huge industry. I think the last time I looked, the US spends 3.5 trillion dollars on healthcare expenditures. It's a huge number. And if you think about the delivery of healthcare, it includes a lot of different things. As a physician, you get to learn how to take care of patients, but there's a ton that you just aren't exposed to, you just don't come to know. And a lot of the other things that includes, that makes up medicine just really interests me. So I decided to go to business school, which really opened my eyes to this whole world of business and finance and the importance to not just medicine but a lot of different industries. And the interesting thing was that in my business school class, there was... I can't remember the exact number. I think it was something like 12 or 15 physicians out of 70 people or so. So that made up the the largest segment of the class. That's very surprising, actually. I would never have guessed that. Right, and I think that speaks to the way that medicine has changed. So when you talk about the intersection of business and medicine, nowadays, you really have to be really focused on the bottom line in medicine. Whether or not you're a solo practitioner, whether you're a health system, or you're a large multi-hospital health system, or something like that. I mean really, it's about taking care of patients but it really comes down to dollars and cents. So if you can't really manage your finances, you're not gonna be able to take care of patients. Yeah, that makes sense. There's some famous song that says, "If it don't make money, it don't make sense." So I guess that kinda applies to medicine, too. On a larger level, I started thinking about how we as a country are gonna pay for all this stuff. I think the other number I saw was on average, the average American spends something like 12 or 15% of their gross income on healthcare expenditures. So anyway, getting back to your question. The intersection for me was kind of understanding how medicine fits into a larger picture, basically. And it's been really helpful for me. Okay, and now that you have been on both sides. So when you think of yourself, do you think of yourself as a doctor or do you think of yourself as a business man? Or which one do you think of first? Yeah that's a good question. I try not to put myself in a box. I think I'm an individual who has a lot of different skill sets. Okay, that's a good answer. Patrick is going all proper and political on me. I thought I was gonna get you, but I couldn't. Okay, alright. Do you think being a doctor gives you an edge up in business or vice versa? Does having a business education help you with being a doctor? I think it can. It can help you being a doctor. It really depends. I know a lot of doctors who, say, you work for a hospital system. You're really focused on taking care of patients. You don't have a clue what the finances or what the insurance or the numbers or anything like that looks like, and it really doesn't matter to you. Whereas, there are like my wife who is a solo practitioner, she's practicing, and she has to be very aware of what her numbers are looking like on a weekly basis, so it really depends. There's a lot of doctors who work in insurance, doctors who work in an industry like pharmaceutical industries, stuff like that, physicians who work within government on a state level or a federal level. So I mean, it really depends is the answer. Well I guess we should talk about WestRock Investments, and Patrick can tell us a little bit about that. Yeah what's WestRock Investments, exactly? Yeah, what is it? What does it do? This is Patrick 2.0, WestRock Investments, so tell us. Yeah it really came out of my love of business. And the way that it started, it really started while I was in business school. I wanted to develop a... I think of it as an entity for my investments, and I've sort of done that. I funded it basically with my own money. And then used WestRock as a vehicle to invest in other businesses. And as it grows, and as the businesses that I invest in grows, that will provide more capital for making more investments and for attracting investors, and yeah. So that's kind of how it started, and that's the trajectory. Right now, I've been focused in the healthcare space. As you all know, I started a company with a partner of mine, and that company focuses on clinical research. So that's an investment I made through WestRock. And then started another company with a couple other physicians that I was working with, where we focused on cost containment for providers. These providers can be hospital systems or health networks or individual provider groups. All this stuff sounds so smart and I'm like, oh my gosh. And Jake is probably getting super excited by all these things, because one of his dreams is to invest in businesses and flip businesses and all of that stuff. So I'm sure he has a lot of good questions for you. I don't know. We'll see. On the website, it talks a lot about principles and values. I know that's important to you. Maybe we can talk a little bit what that means for WestRock? Yeah, as an entrepreneur, as a business person, as a business leader, I think one of the most important things that leaders can do is to be very clear about the principles that they wanna establish and they want to advocate and help to spread throughout an organization. So for me, I spend a lot of time trying to understand which values and which principles I thought where important. Because you know, what you realize is that your product or service may change. It may change from year to year or from decade to decade. The customer's opinions and definitions of value can change over time, but there has to be something that endures. So I don't know if you guys have read a good book. It's a little bit technical, but I know you're a reader. I love books, so tell me. Maybe I've read it. I don't know. What's the name of the book? It's called House of Morgan by Ron Chernow. He's the guy who wrote Hamilton. Oh, I haven't read that book. He became very famous with Hamilton. And he's written about the Morgans of JP Morgan fame and he's written about Rockefeller. He tends to write about business people. But the point I was making was that when he wrote about Morgans, he covered their history, which was more than 100 years. And one of the things that was interesting to me was that if you look at the actual business they were in, it changed from decade to decade, from generation to generation. But the principles had to endure, so principles are incredibly important, I think. And so one of the principles I focused on and helped push in my own organizations was being customer focused, which is super important. And you'd be surprised by how many organizations really don't listen well to the customer. So that's really important. Other things I focused on was things I think I've been successful for myself and things I've read about in other organizations like goal setting. Goal setting is very important for an organization. It's important for an individual, but then you put a whole bunch of individuals together and it becomes even more important. Yeah, how do you keep them on the same page? And I actually just wrote a blog post about having a mission and a vision for your company and then using those two to plan and set goals. And I don't know what the saying is, but something about you can't get somewhere if you don't know where you wanna go. And really, regardless of the size of your business, you need that. Even if you are just the sole person who has a lemonade stand on Central Avenue, you have a tiny business, you want to know where am I taking this thing. And a lot of people overlook that. A lot of business do a good job, but we run into people. It's really hard to convince them to even do a budget, a goal, a plan, any of this stuff, and it's surprising. The other thing that's great about goals is that you gotta know where you're going but then you gotta know if you're actually getting there. And you can't really know that unless you have a clear target. And you can track along the way, how well you're doing or how well you're not doing. The failures or the lack of progress is important, too. Yeah, that's where you learn the lessons. Exactly. I think a lot of people are afraid to set a goal, because they're afraid that they will not accomplish the goal and then they will feel so terrible after. They don't realize that even if you fail, you can learn from the failure. Not everything is going to be peaches and cream all the time. But yeah, goals are hugely important, and a lot of people just think, oh, well, I just want to be successful. Well, what does that mean? And so yeah, you're right. Yeah, and it can be difficult in an organization, especially if people are competitive. It can be really difficult for other people to know that you haven't succeeded as you intended to or as you set out. Like you said, the value is also in the failure, because it helps you know that you need to change and you need to do something different. Yeah, I think that people who have the biggest successes have those failures that predate them, where they learn the lessons that allowed them to be successful. So I think it's not very useful to think about, oh yeah, I failed. I'm gonna get really upset about that. Just focus on the next thing and what are you gonna do there. Yeah, and I read in some book that failure and starting over is healthy for human beings, as just the most basic human beings. There's something valuable in going all the way to the top and crashing to the bottom a little bit. It reminds you that you have it within you to start again, and it's exciting. And so, not everything that we do here at Kapok Marketing is successful. Some things are great, some are okay, some flop, and we just look at them and say, okay, well, what could we have done differently? Also if you're always succeeding, you're probably running your business incorrectly, because you're not taking the right risks. Yeah, you're playing it too safe. You're missing out. There is so much opportunity out there, and you're just coasting along, and some people are happy with that. They're just happy with having a little business, and that's all they wanna do, and that could be one of your goal. Your exit strategy could be just to do it for a little bit and then you sell it or whatever the case is. But when it comes time to sell it, you have to show to the buyer that there's value in your business. But that's also your goal then, then that should be your goal and you should plan how you're gonna achieve that goal. Yeah, I think strategic risk is one of the most misunderstood things in business. I agree. And sometimes I catch myself playing it too safe and Jake has to come in and say, listen, I know it's safe to just be under your little comfort blanket. But no, we really gotta do this. And then you do it and you realize, wow, what was I afraid of? This is actually great. Where is a cellphone when we need it? Measure What Matters is what it's called. Because he's a venture capitalist, he was one of the early investors in Google. He got them to implement this system, which they call OKRs, which are objectives and key results. And one of the important things is that you need to set a goal or set an objective and then measure the key result. Setting ambitious goals will help you to stretch. You have to work hard to get there. And then their measure of success with goals is that you should never complete 100% of your goals. Then you're not working hard enough, you're not pushing yourself hard enough. You haven't set your goal far enough out there. Exactly. They shoot for a 60% or 70% success rate. So not even 80%, maybe 60%. Okay, that's interesting. So we need to take even more risk it sounds like. Measure What Matters, that's the book. I gotta get all these books. Oh my gosh, I have so many books I need to read and so little time, but I gotta get on it. Oh my gosh. So that's another point, though, that I tried to implement, was that we need to measure things in business. I mean, the amount of detail varies from business to business, but you gotta know what kind of progress you're making. And when you're measuring, when you're getting useful information from which you can make decisions, then you're able to make progress. So it's about figuring out having some sort of quantitative or even qualitative information, and then use that to make decisions about which way to go or how well you're doing, how well you're not doing. I know it's tough, but you have to do it. Do you have any other tough questions for Patrick or smart questions? Maybe just shift gears slightly. So how do you determine at WestRock who or what to be investing in? It looks like you're mainly in the medical field, but how do you determine this is a good business or this is a good person to do business with? Maybe we could talk a little bit about that. Yeah, that's a tough question to answer. Well, I can try to tackle it, at least the first part of it, how I choose investments. First of all, I look for strong partners. I think choosing partners are very important, and any investment is really a partnership. You can put money in a business or decide to partner with a business, and you can get totally robbed. But over the longterm, I think if you focus on people that you really admire, people that you respect, people that you want to be around, people that you're okay with arguing with and having disagreements with, and people that you trust, I think you're gonna really just do really well over the longterm. So that's rule number one. It's so crazy. It's all about trust. A lot of what happens in business is pretty much selling yourself and building trust with people. And if people don't like who you are, it's gonna be tough. Even when we just have a client who comes in, where they're saying they might wanna do some business and we're, I don't know, I'm not sure this is exactly something we want to get involved in, even though we're just a vendor, kind of like a partner. But we don't have any financial risk necessarily if they go out of business or anything. You might as an investor. But still, do you wanna be working with them? Yeah personally, I always look at people's eyes to see if they have a soul. Yeah, if it's just super blank behind the eyes and I'm not reading anything, oh, I don't know. I'm not feeling this. There is no soul behind the eyes. And I don't know if that's a good way to do it, but I always look at that. No, I think it's a great way, because you're basically saying trust your gut. Yeah, it's like those subconscious things that you just don't know. I don't know, this doesn't feel right for some reason. It just doesn't feel right. And if we're not gelling, things are not going well, oh, I don't know if I want to work with this person. That person probably doesn't want to work with me, we're just not on the same page. And yeah, trust is very important. So what else do you look for? Yeah, the other thing I was gonna add to that was just try to find partners that you feel that you want to emulate. I try to find the smartest people I can find, the hardest working people I can find, and just ride them until the wheels fall off, do you know what I mean? I'm sucking everything out of you. Give me more. Because I mean you surround yourself by good people, and you'd be surprised the things you can accomplish by surrounding yourself with good people. Recently, we were talking to, I think, Ryan. He worked for the Tampa Bay Rowdies, and he was talking about mentors and finding smart people. And do you have a mentor? I have a couple of mentors. You have a couple of mentors? Yeah, and I'm always looking for more mentors. I mean, can you have too many great mentors? I don't think so. This is something I struggle with all the time, finding good mentors. And for me, it's a continual search. Honestly, I was just on the phone with someone this morning, and we were talking about that, that same issue. I think there's really not anyone who couldn't benefit from a great mentor. And our lives today are so varied. All of us are into so many different things. It's sometimes hard to find a mentor who can really help you in all aspects of your life, so you end up getting mentors for different areas of your life. But I think it's incredibly important, but it's challenging. It can be very challenging. Yes, it is. And we were recently talking to someone on one of our podcast episodes, and he was talking about having a board of advisors and people who just come from different fields of business, and who can help you and you can trust and all of that stuff. And he said that you don't have to be a big business to have those people. You don't have to be a super flashy, fancy rich person to actually have people help you out. Yeah I mean, look how important it is for the kid with the lemonade stand. Can you imagine? You could talk to your mentor on how you're gonna take over the neighborhood, or something like that. So I mean, it's important for everyone, I think. It's so crazy. So now, when you're thinking about the future and thinking about WestRock investments, and all of those things and your goals, and where do you see yourself going, what are your big goals for WestRock? Now Patrick is in the hotseat. Yeah, I guess I have a lot of goals, but I think it's just more of everything, more and bigger. I would like to have more impact with my businesses. I would like to have more capital to invest, have more opportunities, make more connections with people, make deeper connections with people. I don't know that it would be necessarily different. I guess it's just a order of magnitude, or something like that. Okay. Now if I'm a small business and I am interested in finding investors, other people like you to invest in me, how do I make my business more attractive to you? Yeah, that's a tough one. That's a whole other Kickin' it with Kapok episode. That’s a good point. We are also running up against our time limit. Let’s close it out here for this episode. Hopefully we’ll be able to continue this conversation with Patrick in our next episode. With that, I think it’s been a great 17th episode. We’d like to again thank Patrick S Weston from WestRock Investments for joining us today. If you’re enjoying the podcast, please make sure you’ve subscribed. Also we’d be very grateful if you could leave us a rating or review on iTunes or wherever you listen to your podcast. It really helps us out a lot. Feel free to reach out to us if you have any questions or comments about anything we talked about today or marketing in general. You can visit us on our website, KickinItWithKapok.com, or on social media. We're on Facebook, Instagram and Twitter as Kapok Marketing. 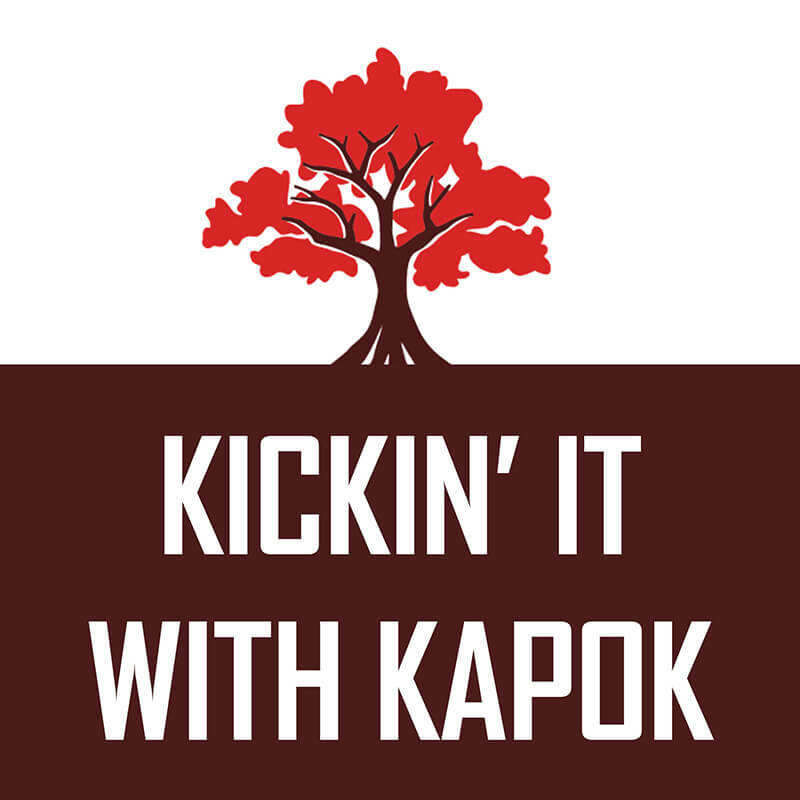 This has been Kickin’ it with Kapok brought to you by Kapok Marketing. Thanks for listening. We’ll have something just as great for you next time.